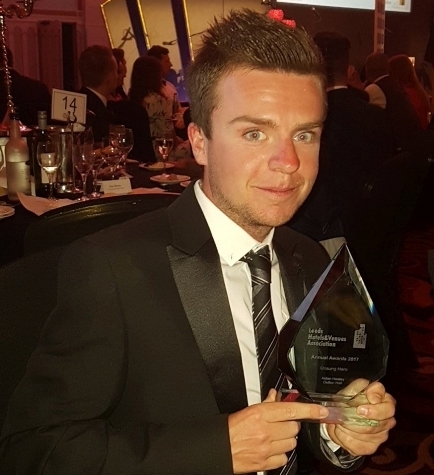 Aidan Healey may have only started his job at one of Yorkshire’s premier golf resorts three months ago but he has wasted no time in making an immediate impact – to such an extent that he claimed one of the top awards at the 2017 Leeds Hotel and Venues Association (LHVA) Awards. Healey, who took up his new role as golf membership sales advisor at Oulton Hall, near Leeds, at the end of March, was the proud recipient of the ‘Unsung Hero Award’ when this year’s LHVA winners were announced at a glittering prize-giving ceremony in Leeds at the end of last month. The LHVA Awards were set up ten years ago to recognise the best in Leeds hospitality, and the golf professional admitted that he was surprised to have even been nominated for one of the main honours, let alone be named as the winner. “To be nominated for the ‘Unsung Hero’ award three months into the job was a great personal achievement for myself, so to then go on to win it was a massive bonus!” said Healey, a former member at Oulton Hall and who was previously a member of the resort’s golf operations’ team. “After spending eight years as a member here before turning professional and becoming an assistant in golf operations, it was great to move up into membership and sales where I could put my ideas across. Part of the multi-award-winning QHotels group, Oulton Hall features 27 holes designed by leading golf course architect Dave Thomas and outstanding practice facilities, boasting the north of England’s leading golf performance centre. Along with Oulton Hall’s QGolf Academy, the top venue offers a range of other facilities aimed at fine-tuning your swing, while the Claret Jug course restaurant is the ideal place to re-energise after a long day on the course. Its unique 18th century former family mansion is the perfect choice for a hotel, with landscaped gardens, sweeping spiral staircases and a state-of-the-art spa.